We love this tool and use it for all our precision rifle rounds. No more primer tubes! No more upside down primers or primers dropped on the floor. And no more potential contamination--your fingers never touch the individual primers. The convenient strips let you sort different primer brands by color coding. The tool has plenty of leverage, so you can seat primers nice and hard, but there is still good, positive feel. The unit is speedy--much faster than any single-cup hand priming tool. A unique universal shell-holding head works with any cartridge you load--no more shellholders to fiddle with or misplace. 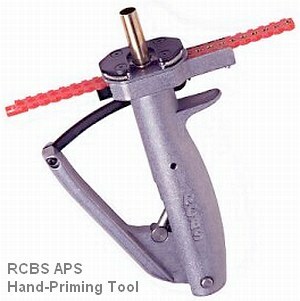 The RCBS APS hand primer is ideal when doing primer comparison testing. You can slide one strip of 25 primers in the tool, seat 5 or 10, then easily remove the strip with the remaining primers, and slide in a second strip with another primer type. You can slip the first strip back in a storage box and the primers remain ready to use. Graf's sells the CCI 450 primers preloaded in strips, item # CCIA450B. The RCBS APS tool costs about $47.00 from major vendors. More Reviews (Click Reviews TAB). See also RCBS Bench-mount strip priming unit. Currently, only CCI primers can be purchased pre-loaded into strips. But there is an inexpensive tool that allows you to load Federal, Winchester, or Wolf primers into the strips. The strips come in a variety of colors (Red, White, Blue, Orange, Yellow, and Black), so you can sort your primers by color.. It takes a little bit of finesse to shake all the primers into invididual slots for the strips, but once you get the hang of it, it is relatively easy. This editor has loaded tens of thousands of Federal and Winchester primers into RCBS Strips with the strip-loader.